In rising tech hubs like New York, Boston, and Atlanta the need for cutting-edge office stock is strengthening year over year. To keep up with demand, developers are reimagining former manufacturing districts as prime locations for new construction and are redeveloping clusters of underutilized industrial assets into vibrant new innovation districts. With loft-style floor plates and soaring ceiling heights, 19th and early 20th century warehouses and factories are uniquely positioned for adaptive reuse projects that integrate millennial-favored trends like flexible office layouts, light-filled open floor plans, and retro-chic exposed bricks and beams. Adapting an outdated industrial space to meet the needs of a 21st century business presents developers with a complex set of design and infrastructure challenges. An essential but sometimes overlooked consideration is how developers can create tech-friendly offices in a building constructed before laptops, iPhones, or even the internet was invented. Cutting-edge technology, high-speed internet connectivity, and reliable wireless and cellular coverage throughout a workspace are now standard offerings in newly constructed buildings. If adaptive reuse projects want to compete with new developments for top tenants, then digital connectivity must be at the forefront of the design process. Just as LEED and WELL have become tools for tenants to identify sustainable buildings or heath-centric spaces, Wired Certification is a benchmark promoting buildings that serve tenant’s critical connectivity requirements. Here are four exciting projects that have made high-tech transformations and achieved Wired Certification for excellent connectivity. The Hall is a prime example for how developers can transform 19th century industrial buildings into dynamic multi-use campuses. 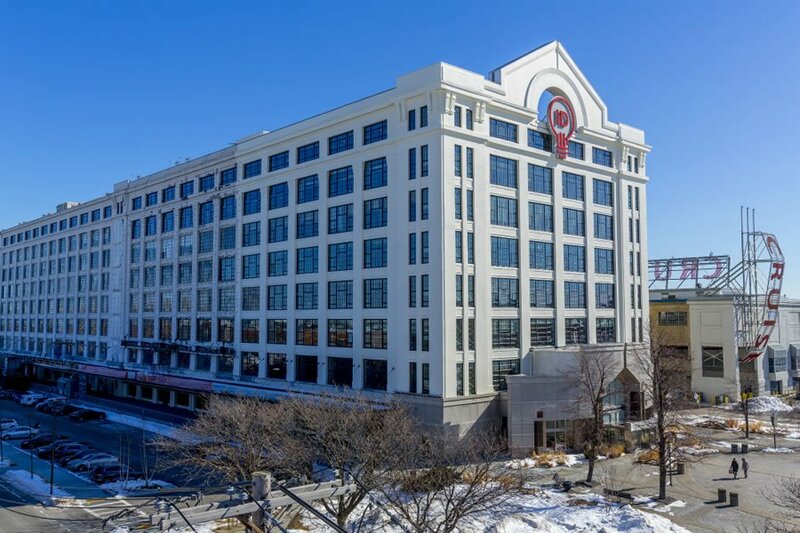 RXR Realty and Westbrook Partners have undertaken a 10-building restoration that includes façade, infrastructure, and exterior improvements. The Hall will be a live, work, play environment that appeals to technology, advertising, media and information tenants (or TAMI as they are affectionately called) searching for offices outside of Manhattan’s prime rental markets. Serving the crowds brought to the area from the redeveloping Brooklyn Navy Yard, The Hall will provide curated retail, live music and other events, and the ease of getting around supported by ride-sharing partnerships. RXR and Westbrook are taking steps to make sure that businesses at The Hall have access to high-speed internet that won’t fail and the option to build out new technology in the future as their needs adapt. Commissioned by the U.S. Department of Defense in 1918 (Happy Centennial!) as a military warehouse, today’s Innovation and Design Building (IDB) in Boston is a titan of modern infrastructural planning. Purchased in 2018 by the developer Jamestown, the majority of the industrial and vacant spaces in the building now serve as commercial space for creatives, designers, engineers, and researchers. This is all thanks to a $100-million renovation, which replaced 1,000 windows, enhanced entrances, improved interior lighting and HVAC functions – among other improvements. Recognizing that tenants like green transport options, 300 indoor bike racks were installed to connect the business hub with the surrounding Seaport district. Jamestown made extensive renovations to the industrial building’s digital infrastructure to ensure tenants’ connectivity needs were met, including technology that boosts mobile reception throughout the 1.4 million square foot complex to make sure you never drop a call. What’s more, in a city like Boston where Hurricane Sandy critically damaged existing structures in the Seaport, the most critical equipment that keeps IDB’s tenants online is secure and protected from accidental damage in case of a flood. Slated to open in 2018, Edison Properties’ Ironside Newark will be a 21st century workplace in the heart of Newark, New Jersey’s revitalized downtown. Formerly a long-vacant warehouse, the property is being transformed into a tech-friendly, mixed-use destination with 456,000 square feet of first-class loft-style office and street-level retail spaces, along with a stunning rooftop green space overlooking Manhattan and the City of Newark. Notably, Ironside Newark was the first redevelopment in New Jersey to achieve Wired Certification for its progressive office building technology, and received the highest level of certification: Wired Certified Platinum. The property has access to an unrivaled network of fiber optic cables that run beneath Newark’s streets – a unique feature that makes the building an ideal setting for tenants with high-speed needs. Ponce City Market, the areas largest adaptive reuse project, breathes new life into the historic Sears, Roebuck & Co. building in Atlanta. From 1926 to 1979, Ponce City Market served as a retail store, warehouse facility, and regional office for the Sears, Roebuck and Co. in Atlanta. From the 1980’s to the 2000’s the property shifted away from retail use and was ultimately closed to the public in 2010. The following year, Jamestown acquired the building and implemented an ambitious adaptive reuse plan. 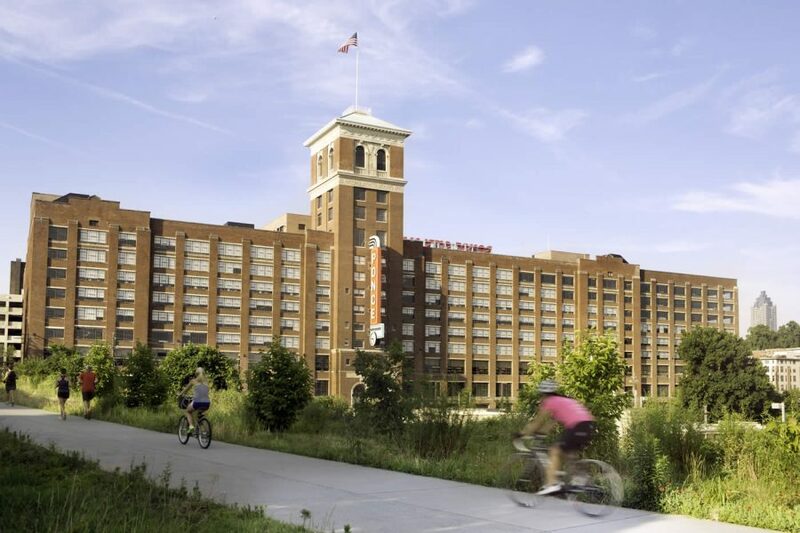 Since reopening in 2014, Ponce City Market has reinvigorated Atlanta’s Old Fourth Ward neighborhood, providing a dynamic mix of luxury apartments, retail, a bustling food hall, and creative office space. It has become a community hub for surrounding neighborhoods and a prime destination on Atlanta’s BeltLine. Jamestown’s tech-friendly office spaces have attracted top TAMI tenants including MailChimp, General Assembly, and an Industrious coworking location. Sustainability and connectivity were two guiding themes of the $180M redevelopment. In addition to installing LED lighting and energy-efficient HVAC systems, Jamestown was able to preserve 99% of the original 1920’s hardwood in the base building to reduce waste and CO2 emissions. Office tenants can choose between multiple high-speed internet options, allowing them to select a service customized to their specific business needs. WiFi is also provided in public areas so workers have the freedom to leave their desks behind and work wherever they want across Ponce City Market. Compared to new builds, adaptive reuse projects can deliver an unmatched appeal that pairs vintage design features and a high-tech experience, outside a traditional CBD location. When converting an industrial real estate asset into creative office space, ensuring the building serves the digital needs of tenants is a critical factor in the success and longevity of a project. Redeveloping to Wired Certification standards ensures that properties are specifically designed to meet the needs of current and future tenants. Is This Box More Valuable Than Its Contents?